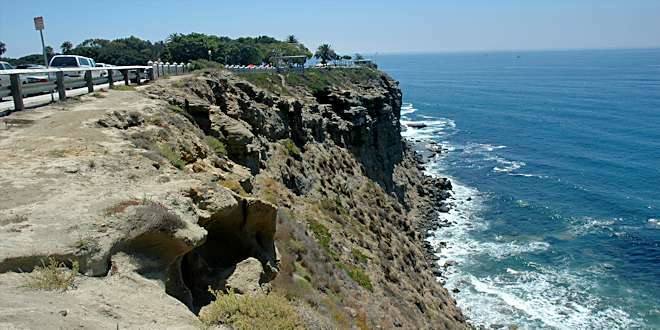 The landing area for Point Fermin is on the hill above the parking lot on the other side of Paseo Del Mar (the road). Don’t land in the park or we could lose our permission to fly at this historic slope. Southern tip of the Palos Verdes Peninsula. SW winds work best. Point Conception (NW up the coast) causes offshore winds from the NW to curve inland so NNW to WNW offshore winds frequently result in good flying conditions. Marine Exchange (PortSource), 350 feet above Point Fermin. DW4695 San Pedro (MesoWest), 2.4 mi. NW of slope. Legendary lift. LZ is on hillside across Paseo Del Mar. Please don’t land in the park and no combat. Take the I-110 all the way to the south end where it dead-ends into Gaffey St and turn LEFT. Go S on Gaffey St for 2.7 mi. to Shepard St and turn RIGHT. Park in lot to the right or on street. Flying area is just to the right of the gazebo near the street. 33.74616, -118.29227 • End of I-110 at Gaffey St.
33.70698, -118.29289 • Junction of Gaffey St. & Shepard St.
33.70758, -118.29477 • Flying Area.